This short excerpt was transcribed from Dr Joanne Kong’s TED talk in 2016. It describes the terrible suffering and desperation of sows in factory farms. This is the story of a sow. My entire life I am kept in a metal gestation crate in half darkness on a graded concrete floor. I can’t even turn around. Confined and unable to engage in any of my natural behaviours, I suffer depression, frustration and neurotic behaviour sometimes screaming and biting at the bars that surround me. My limbs are swollen, I have open wounds, and I am lying in my own excrement. After giving birth from being forcibly impregnated, my babies are taken away from me and I am slaughtered at the age of only 3-5 years old. 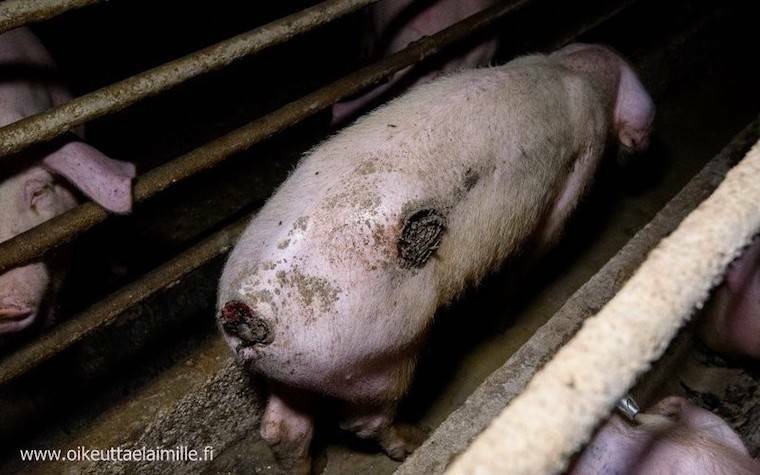 We pigs, like the other animals in factory farms, are supposed to be stunned into unconsciousness before being killed, but many of us are still alive as we are hoisted upside down, our throats slit, and we are lowered into boiling water to remove our hair. But did you know I have a sense of self just like you. I am more intelligent than a dog or a cat and even a three-year old child. I am a highly social creature, intuitive and emotional, just like you. I have memories, and I can recognise myself in a mirror, just like you. I love to play even computer games, just like you. I care for my young with a bond that is as strong as any human mother, even singing to my babies during nursing. I am not something, I am someone. I am not pork. I am not bacon. I am a living, feeling being, just like you.